Image caption The reports calls for a change in social care culture to "promote independence"
The number of people living in care homes in Hull could be cut by a third under plans to save £18m from adult social services by 2020. A council report calls for "a very significant reduction in the level of long-term care commissioned from independent sector providers". Figures project a reduction of care home residents from 1,450 to 955 by 2020. 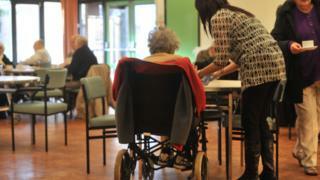 The authority would move services in house and encourage independent living. An extra 39 workers would be hired to implement the changes. The report discusses changing the culture of adult social care in the city from "doing things for people and creating dependence" to "a focus on enabling people to do things for themselves, promoting independence". Figures show that in 2015 Hull had higher than average number of people in the social care system than other local authorities, with 57% compared with an average of 44%. The report adds that the figures indicate that Hull "requires a more robust triaging at the front door". It also calls for an "active recovery" policy to try and reduce the number of people needing support. The report will be discussed by the council's cabinet committee next week and, if approved, the changes could be implement by early next year.